The multiverse migrates out of science fiction for a fling with romance. Eva Edelstein, biking to class in 1958 at Cambridge, runs over a rusty nail. A tall, blue-eyed student, Jim Taylor, offers to fix her tire. In version one, she accepts his help and eventually marries him. In version two, she is muddled and marries a less-likely beau. In version three, Eva marries the same lesser bloke but makes a course correction midbook. In bite-sized alternating chapters, Eva’s and Jim’s lives spin along, apart and intersecting, together and fraying, over the next 56 years. Newcomer Barnett labels each chapter installment as version one, two, or three. This triple-braided structure builds poignancy, as the same 30th birthday party or funeral, populated by the same characters, unspools into different outcomes. So Eva is “plumping cushions” while Jim’s lover Helena is “cleaning, tidying” in parallel but different stories as Jim paints a triptych he calls The Versions of Us. Children arrive, toddle, grow into sullen adolescence, and launch families of their own. Careers founder or flourish; infidelities are pursued. Pot is inhaled throughout the 1960s; tobacco is smoked to the end. In every era, cats are petted under their chins, and vats of alcohol swilled. Secondary characters—Eva’s best friend, Penelope; Jim’s art dealer, Stephen—are barely inhabited devices. Barnett, a British journalist writing her first novel about British journalist Eva trying to write her first novel, has a weakness for clichés and clunkers, such as “Do you see how beautiful we are?” Beauty is not enough, of course. Those readers particularly fond of the one-true-love trope will overlook what cloys. Others will long for the superior sentences and searing London Blitz scenes in Kate Atkinson’s Life After Life, a much better multiverse novel. Still, this debut work, like three snowballs running downhill, gathers the old-fashioned Newtonian momentum of a good yarn. We see the consequences of small choices echoing through the years. 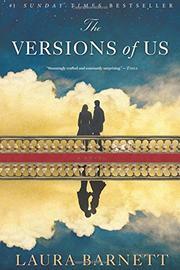 Fans of the novel One Day and the movie Sliding Doors will want to pick up this debut.